Home › 2 In 1 Trunk Organizer & Cooler Set - Collapsible Folding Flat Trunk Organize..
2 In 1 Trunk Organizer & Cooler Set - Collapsible Folding Flat Trunk Organize..
2 in 1 Trunk Organizer & Cooler Set - Collapsible Folding Flat Trunk Organizer Storage 2 Piece Set for Car SUV Truck in Black By USA Cash and Carry - PrimeTrendz TM. Fully Collapsible and Portable Trunk Organizer with Insulated Cooler Insert. Sturdy Construction. It Holds Up to 40 lbs. It Helps You Keep the Trunk of Your Vehicle Neat and Clean. Its Made out of 600D Poly Canvas for Extra Durability. Organizer Dimensions are 21"x12.5"x12.5". Size: Trunk Organizer With Cooler Three section collapsible trunk organizer with removable insulated cooler.Leak proof thermal shield insulated cooler keeps food and drinks at theperfect temperature. Organizer includes mesh pockets on the sides. Holds andorganizes everything you need for your day. Keep your trunk of your vehicleneat and clean. Great for storing tools, maps, cleaning supplies, bottles,emergency tools, groceries and much more. Organizer dimensions are21"x12.5"x12.5". Its made out of 600D poly canvas for maximum durability. Spotclean and air dry. No more messy trunks. It holds up to 40 pounds. 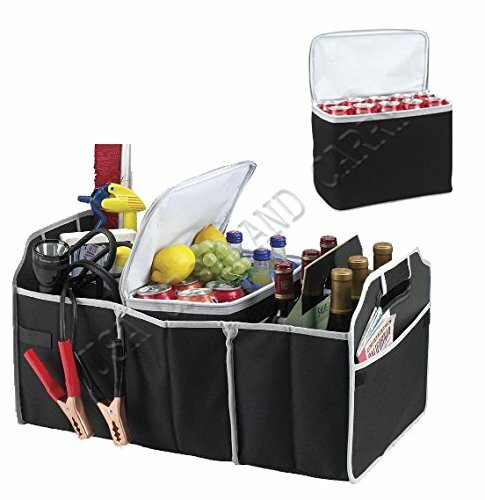 2 Piece setincludes; collapsible Trunk Organizer and Cooler insert. Busy families willlove this collapsible trunk organizer with multiple sections. Your car staysuncluttered and groceries won't roll around, you can even keep them cold forthe ride home. Great for keeping sports gear, cleaning supplies & groceriesorganized 3 Large sections trunk organizer Strong poly canvas constructionMesh pocket located on the outer side, Great for storing maps and otherdocuments Collapsible, folds, flat when not in use 21"x12.5"x12.5". Werecommend you to purchase from USA CASH AND CARRY. Warning!!!... Don't befooled by listings other than USA CASH AND CARRY. Made Exclusively by USA Cashand Carry - PrimeTrendz TM.